Some love it, others hate it. London's newest skyscraper has divided opinion, but now it's really heating things up - literally. 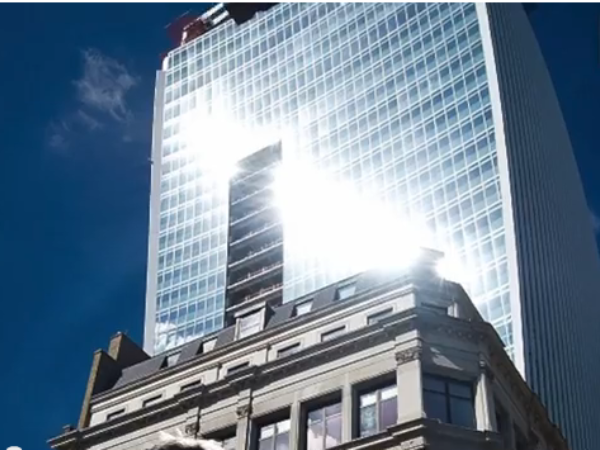 Developers of the unfinished "Walkie-Talkie" building - so called because of its shape - said yesterday they’re investigating the way the building reflects sunlight, after claims the intense glare melted parts of a luxury car parked nearby and caused a small fire outside a shop. Businessman Martin Lindsay told the BBC his Jaguar's mirror, panels and badge had all melted from the concentrated heat of sunlight reflected from the building. A barbershop owner also claimed the glare burned a hole in his company doormat. The half-finished 37-storey tower is one of the most distinctively shaped skyscrapers in London's financial district. The building is expected to be completed in 2014. In a joint statement, developers Land Securities and Canary Wharf said they’re investigating and taking the matter seriously.